Do you get overwhelmed when looking at the many garden hand tools in the gardening aisle of your home improvement store? Do you have trouble differentiating a shovel from a trowel? If so, then it is time to learn the necessary tools that every gardener needs to succeed. From pruners and loppers to axes and hatchets, every tool that you buy can do its part to turn your garden from a slab of dirt into a plentiful oasis. To guide you on your journey, we would like to introduce our favorite garden hand tools. It is true that not all garden hand tools are created equal. In fact, there is such a variety of each type of device because everyone handles them differently, and the same tool is capable of working for a variety of uses. To be the best gardener you can be, you want to pick the proper garden hand tools for your needs. One of the factors you want to look for in garden hand tools is how they feel in your hands. While you're shopping, pick up several different options with the idea that you will be doing hours of work with this one tool. Does it have a good grip? Is it too heavy? Does it feel fragile? If you know what you will be doing with the tool once you get it, mimic these movements in the store and determine if it is the tool for you. Knowing that you will be using this equipment for a long time, choose garden hand tools that are well constructed to last the long haul. Play with the tool a little before you buy. Does it wiggle or feel cheap? Then the odds are that it is. In many cases, it is all about the handle. Wood makes the best handle because wood can absorb shock better than plastic. 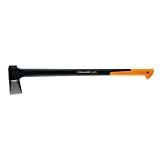 If you're looking for a less bulky tool, carbon fiber handles are great because the material is very lightweight but strong enough to endure long periods of use. As for blades, stainless steel is the way to go. It is one of the strongest metals, and it won’t dull as quickly. Of course, you want to choose tools that are right for the job. If you have a small garden, you can probably skip a shovel and go with a trowel. Think about the tasks you will be doing. 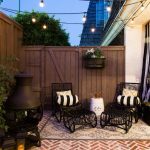 Are you planting containers on a patio? Or are you planting a vast vegetable garden? These different applications require different tools. 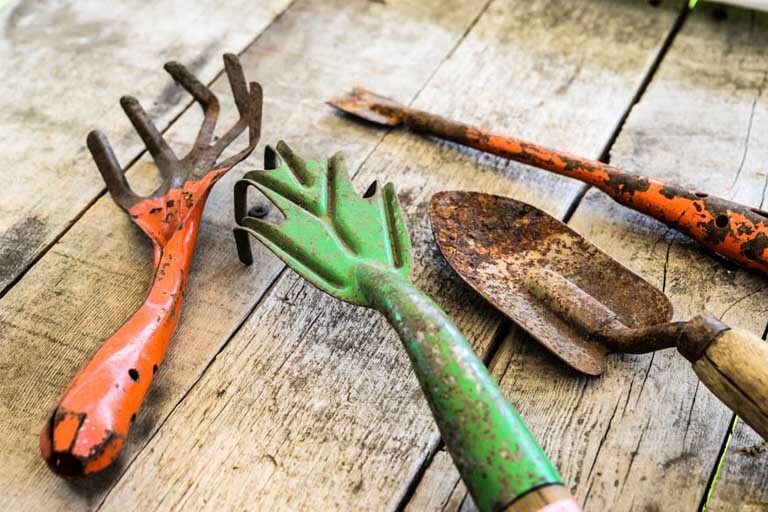 Do your research to pick the right garden hand tools for you. You can research by going online, reading reviews and searching for others who complete the same gardening functions as you do. Do they recommend this tool? Do they recommend something else? Then look into that tool. Once you know what you want. Buy it online or go to the store and see how it feels. There are many different garden hand tools out on the market, and they each have their individual uses. The more tasks you plan to complete in your garden, the more tools you will likely own. Each type of tool performs an important function in our gardens. Drop forged body and handles. Quality blade made of high carbon steel with Ultra-fine Polishing Technology. Ergonomically designed non-slip handles are strong,lightweight,and comfortable. 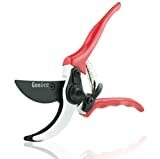 Hand pruners are garden hand tools for trimming and shaping plants, pruning out dead foliage, and cutting perennials, among many other tasks. There are several types of hand pruners with the most common being bypass, anvil, and ratchet pruners. The most popular type are bypass pruners which have two blades that bypass each other for a nice, clean cut. The good thing about bypass pruners is that they are perfect for heavy duty jobs including cutting thick branches. Anvil pruners have straight blades that complete a slicing cut similar to a knife. They are best suited to cut dead wood. They are a bit bulkier and designed for more substantial work. 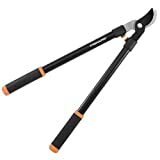 In contrast, ratchet pruners are similar to anvil pruners, but they are intended for those with smaller or weaker hands. If you plan on using pruners as your primary tool, then the ratchet variety might save you potential hand pain. A lopper is basically a version of a hand pruner but on a grander scale. Loppers are similar to pruners as they come with either bypass or anvil blades. The primary difference is that they come with long handles. These handles create better leverage, and so they are easy to use over long periods of time. Opting for a bypass lopper will give you a smooth cut as you chomp through plants and sticks. This smooth cut allows for the plants to heal more efficiently. Anvil bladed loppers feature one straight blade and a curved blade. Because of the blades, these loppers are best suited for dead wood or clearing away debris before coming in to make your clean cuts with the bypass lopper. Weeding knives are ideal for getting rid of weeds in smaller gardens and flowerbeds. These knives are great because they give you more control in smaller areas, so you don’t accidentally uproot your plants. The knives also have strong blades and more manageable handles for long-form work. There are slightly different variations of these gardening knives. 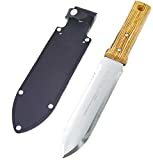 A typical digging knife will usually come with a blade with a straight and serrated edge. Heavy duty digging knives can cut through the roots of more stubborn weeds and aid in weeding between pavers. Another version is the fishtail weeder which is perfect for prying up weeds like dandelions out of the ground. The fishtail weeder usually has a long handle and a V-shaped blade perfect for getting around the root of weeds. Because any garden requires a certain amount of digging, shovels and trowels are must have garden hand tools. When it comes to shovels, there are many varieties from which to choose. With shovels, the difference is in the blade. Two of the most common gardening shovels are the round point and square point varieties. 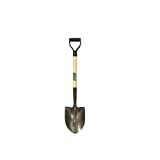 The rounded point shovel has a durable blade that comes to a point, which makes it great for digging in the hardest soil and making a clean break through tough roots. A square point shovel doesn’t really come to a point at all. 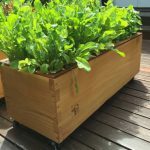 Instead, it's a square blade that is great for lifting and transporting soil and plants. The long handle is great because it allows you to pick up a lot without hurting your back. A square shovel is also ideal for gardeners who live in dry areas as it can better penetrate compact grounds. If you are digging and planting on a smaller scale, then a trowel is one of your ideal garden hand tools. There are many different types of garden trowels with the difference being the blade. 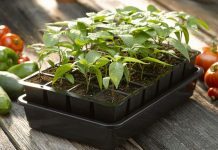 Use trowels for a variety of tasks from potting and planting to weeding and transplanting plants. If you are new to gardening, it is best to go with a standard towel. It is a multipurpose tool for transplanting bulbs and seeds, dig out shallow-rooted weeds, and mix in fertilizer. One of the most utilized garden hand tools is the hoe. The most recognizable tool in this category is the paddle hoe. This hoe has a long handle attached to a small rectangle blade and is an excellent tool for dislodging weeds and shaping soil. For stubborn weeds, try a stirrup hoe. This hoe has an attachment that looks like a stirrup on a saddle and is ideal for loosening stubborn weeds. When used, the saddle moves in a back and forth motion, loosening the soil without making a mess. Finally, the collinear hoe has a short and narrow blade and is great when dealing with rocky ground. Rakes aren’t only used to gather leaves, they have multiple other uses, making them one of the premier garden hand tools. One option is a bow rake. This is the heavier duty rake with a long handle paired with short and thick metal tines. This rake is excellent for leveling dirt and moving mulch. If your garden is close to a fence or other plants, then a shrub rake may be your best option. 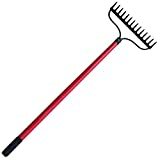 The shrub rake is built like a smaller and thinner leaf rake. It is a good tool for getting around tighter areas. If you are working in a smaller garden such as a flower garden, a hand rake may suit you. The short handle gives you better control in tight spaces and is a perfect tool for planting. RAZOR TOOTH 7TPI CURVED BLADE - Curve Styling Makes Cutting & Trimming Effortless! For larger scale gardening projects, you may need to use axes, hatchets and hand saws to get the job done. These garden hand tools can chop and slash away debris and help you beautify your home planting project. 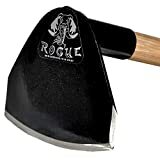 Axes and hatches differ only by their size, with the hatchet being about half the size. Axes use two hands, a hatchet with one. Use both tools to chop up smaller pieces of wood. A hatchet can clear away bigger pieces of debris and make room for you to plant. Small hand saws are for similar applications. Many plants can be in danger when crowded, so a hand saw can clear away shrubs and other plants to prevent overcrowding. You can also use saws to cut off pieces of a plant that you don’t want growing there. Many saws are angled so you can fit in tight spaces and get rid of what you don’t want and keep what you do. There are several other types of pruning saws. 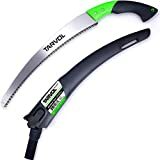 A pole pruning saw has a long handle attached to a blade and is suitable for getting to higher branches. The straight blade pruning saw is ideal for thinner branches while a curved blade saw is perfect for thicker branches. For your plants to thrive, you have to be sure that your soil is fertile and rich in nutrients. To do so, get a soil testing device because all the garden hand tools in the world won’t help if the soil is unhealthy. Professional soil testing kits often include all the tools you need to collect soil samples including the required chemicals for testing, and are ideal for a variety of applications. If gardeners don’t want to use chemicals, a dual probe soil tester is a quick and easy way to test soil. 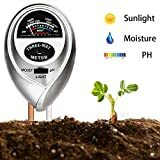 With this device, you simply stick it in the ground, and a digital or analog gauge will give you the results right there and then. Many of these gauges don’t even need batteries. There are many different soil testers out on the market, so research before buying. 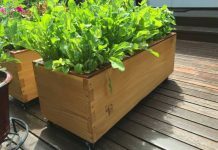 Since gardening is such a such a popular business, these and many other garden hand tools are available at just about every home improvement store. If you know exactly what you want, then you can buy garden hand tools on sites like Amazon or other online retailers. 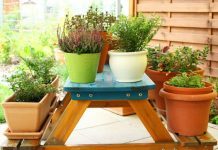 However, if you want to get the feel of a piece of garden equipment before you buy, it is best to go into a brick and mortar store for your purchase. In general, these common garden hand tools will cost in the range of $5 to $100. In many cases, you can find many of the tools you need as part of a kit at very affordable prices. Few tools will break the bank so take extra care to choose the tool that will suit you for years to come. Gardening has been one of the most fun and rewarding hobbies since the beginning of time. There is really nothing like starting from a flat patch of land and seeing it involve into a vibrant garden. When you select the proper garden hand tools, you increase your odds of success tenfold. Many of these devices have been around for centuries, so have them in your arsenal, and your garden will thank you for it. Of course, this list of garden tools is just the tip of the iceberg. There are many other garden hand tools out on the market that can help with an unlimited list of applications. Is there any tool missing from this list that you simply cannot live without in your garden? Tell us about in the comments!